“Rajodi Beach is located at Vasai Virar coastal belt, far North Suburb of Mumbai at Thane / Palghar District on western railway route. Mostly frequented by locals, But with latest water sports and adventure activities and Dolphin spotting, The crowd has marginally grown. Updates 2019 : February brings in good news for locals and Mumbai citizens as a group of Dolphin fishes are seen wandering around Rajodi beach coastal. Employees of Blu Life Adventures spotted Dolphins (About 8 to 12 in number) at some distance from beach area. HP Liv news has covered a video about same. It is a good news and a proof that Dolphins are here that the sea water and beaches of Vasai virar are much cleaner compared to others in city area. As said all four beaches are in queue and are named along the respected villages. Rajodi being the second beach in line is much cleaner, flat surfaced, safe, pollution free, black sand beach with less tree shades compared to adjacent beaches. It has a man made rocky belt at entry which is an ideal place to seat and have a sea view. Although a very good beach to walk or spend an evening with family friends or your beloved, i would not recommend this beach for picnic as their are very few resorts, that too with average food quality. 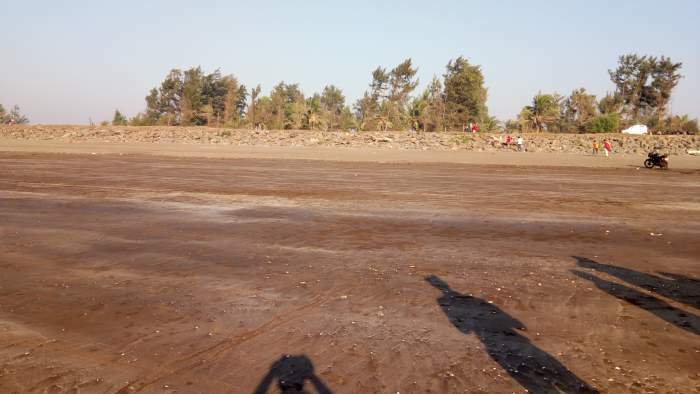 If you are planning beach side picnic with medium to large group Arnala beach or Navapur will be a better choice ‘COMPARITIVELY’, or head to Uttan beach at Bhayandar. Although safe and no incident with picnic group or tourists yet heard, Consider Rajodi as a day only location to have fun around and plan to leave the beach upon sunset as the entry of beach gives the feeling of isolation and like other connected beaches, few locals are found drinking around sometimes. One can see locals playing cricket and football on this beach, washed out broken shells is another attraction at times. 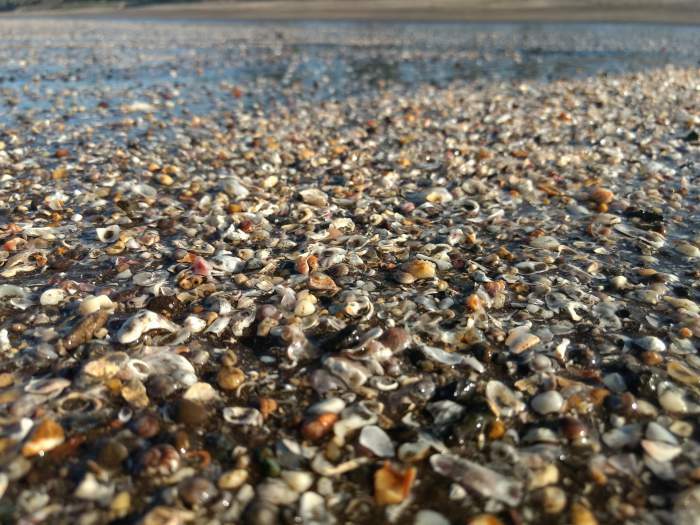 Water level is about 100 metres distance from shore and during high tides it reaches the rocky patch that can be seen in the pictures on this page. Beach Quality and Neatness : A clean and good quality of beach with positive vibes, Scenic, Pollution free and much better then other beaches around as major frequented by locals of Vasai Virar Location. Safety : In Terms of water currents, it’s a flat beach and safer compared to Arnala. No other anti social elements seen around, But bit isolated as detailed above. Food Options : Consider carrying enough water and food or purchase it at Satpala village junction at few kilometres from Rajodi beach. Car and Bus Parking : No Special parking area, So park anywhere around beach or road side as suitable according to the size of your vehicle. Best For : Evening walk, Sunset view and couple of hour visit only if around Vicinity. Not ideal for day or overnight picnic. Rajodi Road Distance : From Virar Station (19 Minutes, 6.9 Kilometres), From Nalasopara Station (17 Minutes, 6.3 Kilometres), From Mumbai (Approximate 2 Hours, 65 Kilometres). Recently, A water sports company called ‘Blu Life Adventures’ started some exciting water rides at Rajodi beach. Such water sports is rare in Mumbai and except H2O located at Girgaum Chowpatty beach, People in city usually need to travel all the way to Tarkarli beach (Konkan) for all such activities. 3 Level of water activities which are Easy, Medium and Hard are available and can be done under instructors guidance. These water sports are also avilable at the neighbour / connected Arnala beach. Tubing Ride : A basic level four seater ride where people sit in group and the rides is pulled via a speed boat. Tube smoothly glides on sea waves of Rajodi beach and the fun begins. Waterski Ride : It is a advance level water ride, But can be done by beginners too. Professionals guide you for your very first Water Ski Experience at this Vasai Virar’s serene beach. Wakeboard Ride : Yes, Now Wakeboard ride is also available at this beach not far from Mumbai. It is a thrilling adventure ride and Rajodi is one good place to beging with. Jetski Ride : I am sure, Jetski is always on top and favorite on most people water sport list. A speed boat ride experience via this two seater Jetski is now available at this beach. Banana Boat Ride : Another fun water ride for that wonderful group experience. Ride fast and toggle upside down to enjoy the fun of thrown into the sea water. Fly Fish Ride : This is actually a unique and new ride to Mumbai people. Not even other water sports have all this fun and Fly fish is one of them. One can literally feel the fly up above the waves safe on the rider. Towable Ride : Towable, the word seems to be related to Towing and that is what this ride is all about. You select your seat and relax back. Next, you will be towed at a, exciting speed to get all the fun. Ferry Boat : To have a evening sail to enjoy the beautiful sunset and to reach Arnala fort which is not very far, Ferry boats are also available. Enjoy the fun of this rides too. By Train : Recommended nearest railway station being Virar or alternately Nalasopara as adjacent connected station (Both West side). Buses and Auto from railway stations easy available. Follow the Road route as detailed below. By Road : On National Highway 8 (Mumbai Ahmedabad Highway) get inside Virar (10 Km to city), Take East West Flyover to west, Go Straight till OLD Viva College, Take left and reach ‘Bolinj Agashi Road’ and Ask Locals to reach Rajodi / Satpala Junction. The Route from Virar city to Beach is bit complicate (Another 7 Km Approximated). Use navigation apps or ask for help. Below is the road map. NOTE : Auto don’t run on regular metre system like Mumbai and they charge fix amount anywhere from Rs.150 to Rs.200 depending on number of people. Couple of Small Cottages and Resorts like Mamta, Marine Beach and Kshitij Resorts are available near this beach. Many small and medium size resorts are available around coastal between Virar and Nalasopara like Anand resort near Arnala and many similar. Consider food quality to be average at many resorts near and around Rajodi and Other beaches and so is why i recommended these beaches for one day only and not overnight stay. Finally its your own decision. 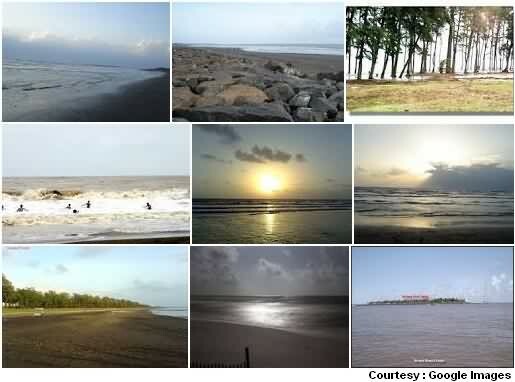 Connected Beaches : Arnala, Kalamb, Navapur and couple of beaches at Vasai like Bhuigaon. Temples & More : Virar being and as i recommend near Rajodi, Has many places to see. Agashi Jain Temple, Jivdani Temple, Mahavir Dham Jain Temple (On Virar Highway) and Yazoo Park. Pictures Courtesy : Shubham Sony, Parth Rathod.